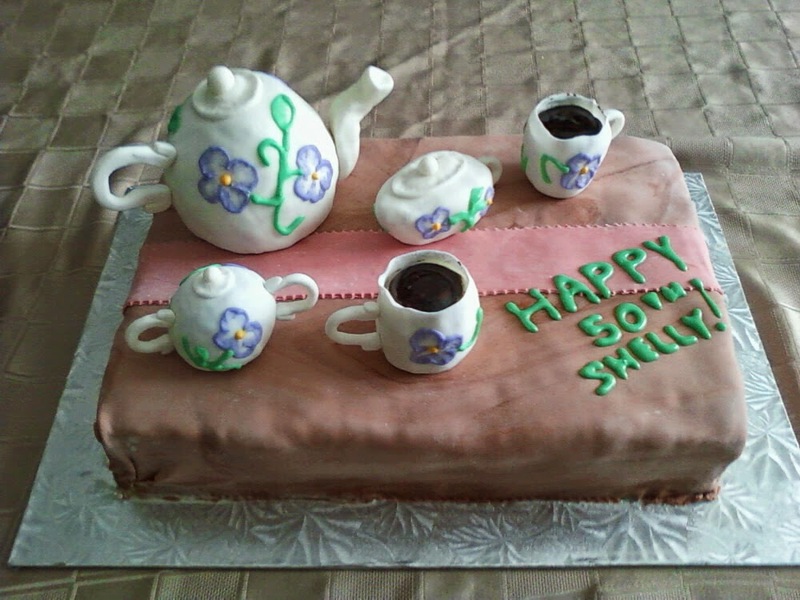 For my mother-in-law's 50th, I wanted to make a special cake for her to celebrate. She is an avid tea-drinker, so I figured a tea set would be the perfect decoration. I made a 9x13" sheet cake for the base (my fave 4 egg yellow cake recipe) and filled and crumb coated it with an orange buttercream. I covered it with homemade marshmallow fondant tinted with brown gel food colouring, but not fully kneaded in to give it a marbled look similar to wood grain. I made a table runner from a strip of fondant, then got to work crafting the toppers. I made a teapot, creamer, sugar bowl and two teacup shapes from rice crispy treats, then coated them with icing to make them smoother and covered them with white fondant. I sculpted the handles, spout, and lids from fondant and let them dry overnight in the desired shape, otherwise they were very droopy. Using a quick confectioner sugar icing and a small circular icing tip, I piped a floral/vine pattern onto the tea set, and used the brushed embroidery technique to make it look like china. I painted the inside of the teacups with brown gel food colouring to make it look like they were filled with tea. Tea cup filled with "tea"
I attached the much stiffer dried handles/spout the next day with toothpicks, and stuck the tea set to the cake with skewers. I piped a Happy Birthday message in the corner and the cake was ready to present! This was a fun project, and tasty too (love that orange buttercream). I love the brushed embroidery, it is an easy technique with big results!